Crazynite.io | Play Crazynite.io free on iogames.space! 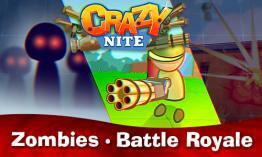 Crazynite.io was inspired by popular new game Fortnite. Is a free unblocked online 2d io game with elements from Fortnite. You can save yourself by building walls. You will need the wood for the wooden wall, the bricks for the brick wall and the iron for the iron wall. Wood can be made from trees and wooden objects, bricks from brick houses walls and stones, iron from cars and suitable garbage. 1. The popular battle royale mode with the opportunity to build walls for shelter anywhere. Players landing by parachute, discover the map for weapons, ammunition and armor, use wood for building walls and kill other players. All this is complicated by a narrowing zone, outside of which all players die. Therefore, if you want to survive, you need to be in the zone. The last surviving player becomes the winner! 2. Death match mode is real bloody mess! Players descend by parachute and endlessly fighting. After you are killed, you can continue the battle again by parachuting and try to get the top 1. Only true master can get the top 1, the game determines your skill level using the following formula: Damage done * Kills / Death + Victim skill * Magic. 3. Zombie mode. Players can not kill you, because you guys have a more serious problem - zombies! You are safe until the sun shines, but when night falls - zombies will come. If you do not have time reach agreement with other players and build a strong defense, then you might not survive a night. Every night will increase zombies. Try to survive as long as you can! 4. Single weapon mode is very similar to the death match mode, but here you don’t have to discover for weapons in the boxes, here they are immediately in your hands, and in the hands of other players exactly the same weapon. Players after a certain period of time is given a new weapon. It can be anything from a knife to a machine gun or the cannon. In the boxes scattered inside the map, you will not be able to find another weapon, only bandages or something else.